It's been half a year or more since these pictures were taken and I don't know why it's taken me this long to share them, but here they are now. For many many reasons I am truly lucky to have Mary as a close friend. In addition to all the help she's given me in the kitchen, she's just a swell person. I adore her. From time to time she and I meet online on weekend mornings for cooking projects. Most of the time it's bread, but we've done some other stuff too, including our King Cakes and this Baklava. I'd taken the book The Olive and The Caper out from the library and fallen in love with 3/4's of the recipes. The recipe and variations of the baklava interested me - the only history I have with the sweet is buying the occasional piece from the Middle Eastern market we stopped at once in a while when we lived in Calgary. But it sounded like fun and not too hard, and Mary thought the same so in the fall we made baklava together - her on the East coast of the US, me on the West coast of Canada. Below is the ground walnuts and almonds mixed with cinnamon and melted butter. The filo is brushed with melted butter and stacked in the baking dish, then layered with the ground nuts. I'm pretty sure I cheated and did fewer layers than I was supposed to so I wouldn't have to go buy more filo. After the layering is complete, use a sharp knife to cut the dish into diamonds. And then bake until golden and crisp. But don't taste yet, it's not done! You have to make your syrup to pour over the top. I made the coffee syrup from the book as it has no alcohol and some of my co-workers don't drink. I think Mary made her syrup with orange liqueur. Then you must wait at least a couple of hours to allow the syrup to soak into the layers. I was pleasantly surprised at how...authentic this tasted. And it wasn't difficult either. I took some to work to share the next day and it was gone within minutes. A couple of people even asked what store I'd bought it at! Gorgeous, gorgeous. Make sure you really love Baklava or have lots of people to share with, this will get soggy within a few days. May is Ilva's month in Bread Baking Babe land. The recipe she chose for us is an Italian roll called Pane di Pasta Tenera Condita, or Italian Knot Bread. This is a pretty straightforward bread, and though the list of ingredients is a little long, it's easy to make. The twist (heh) on this dough is that the buns are formed into knots. A technique I had a tough time wrapping my head around. The dough starts with a biga - a preferment made the day before. I was a little nervous because the recipe didn't specify if the biga should be soft or firm. Mine was very firm and I worried that it wasn't right. Saturday afternoon I finished the dough and left it to rise. If it didn't rise I'd have to bow out this month. I cut and weighed the dough into 125g-ish pieces then attempted to knot them following Ilva's instructions. It didn't go that well, but they turned out pretty ok. I left some plain and sprinkled some with salt before baking. They are just lovely little knots, so tender on the inside. We've dunked them in soup, made them into sandwiches, warmed them and slathered them with butter. So, so wonderful. Head over to Ilva's for the recipe, then head over to the blogs of the rest of the Babes to check out their knotty breads. We've been trying for a long while to improve our eating habits and overall health. We have good times and bad times with that, as I'm sure a lot of people do. The things I find are most helpful for me are recipes that are fast and/or can be prepared in advance, and recipes that supply nutritional information. For me not only does having the nutritional information stop me from making poor choices (sometimes), but it also guides me towards trying recipes I might not normally. 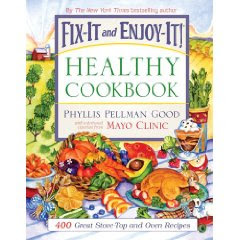 If you wonder if Fix It and Enjoy It Healthy Cookbook delivers, take a look at the back of the book - "Yes, it is possible to combine tasty, quick and healthy!". And it does. 400 recipes. All relatively fast (5 minutes to 2 hours cooking time), all with nutritional information, and more variety than I could have expected. 55 salad recipes. 24 appetizer/snacks. 56 soups. Each recipe includes full nutritional information, prep and cooking times, and a graphic showing how the dish fares on the Mayo Clinic Healthy Weight Pyramid. There are no photos in the book but the dishes are all solid familiar meals that don't inspire fear without photos. I tried a variety of recipes from the Main Dishes, Vegetables, Breakfast and Snacks/Appetizers. All of them came out very well and all of them were prepared/cooked within the time frame given in the recipe, something I often find doesn't happen. I enjoyed everything I made and I've got to tell you, this book is worth buying for the baked sweet potato fries (pg 136 - and 56 calories per serving!) and the fat free strawberry yogurt dip (pg 243) alone. Well it's been something like 7 months since I was there, so I guess it's time to share some Seattle photos with you. It was torture to be somewhere so fun with such wonderful foods and not being able to buy all the stuff that just looked so good. But it was very very fun to walk around and look at all the vendors and their ware and people watch. Knowing there was a weight limit on my suitcase when I flew back to Canada I wisely but sadly stayed away from all the book shops and kitchen stores. Pictured is the clam chowder (voted Nations Best!) and the crab roll, and the vegan chowder and the curried chicken roll. It was all fabulous, but the vegan chowder rocked. So what does this have to do with Strawberry Soup? On the ship I had my first ever fruit soup - blueberry. It was wonderfully light and refreshing. My parents had gone on a cruise earlier last year and were now huge fans of fruit soups themselves. We had my parents over for Mother's Day brunch last weekend, and for my Dad (and the rest of us) I made Strawberry Soup. This soup is ridiculously easy to make, fast, pretty and elegant. I made this with Costco strawberries, part of the 123456789 Mile Diet. I am looking forward to varying this in the summer with fresh sweet BC fruit. Combine in a saucepan and bring to a boil over medium heat. (Or microwave in a glass bowl until boiling.) Remove from heat. Cool. I cool the syrup in a bowl placed in a larger bowl of ice - very fast. Puree until smooth in a blender. Pour into a large bowl. I leave in the blender and finish the soup in the blender. Add to pureed strawberries with apple juice mixture. Cover and refrigerate until well chilled. Garnish with additional strawberry halves (optional). The soup freezes well and is especially good with small ice crystals left in. Migas. Do you know it? I didn't, until a couple of days ago and all I can say is - where have you been my whole life? Migas is a Tex-Mex egg dish made with torn up corn tortillas. A kicked up scrambled egg. Scott borrowed Rachel Ray's Big Orange Book for me from the library last weekend. I know, say what you will about her but we have cooked some mighty fine recipes out of her books and magazines. Beergaritas, pulled pork, asparagus popover....all healthy and nutritious fare. Anyhoo, the other morning I was looking for something to make for dinner because I completely forgot to make a menu plan for the week and the book practically fell open to page 106......Mighty Migas. Does anyone know how to say Migas correctly? I've been saying MEE-gas. Is that right? 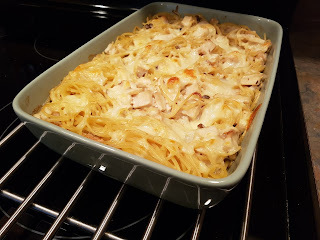 The recipe is pretty easy and there weren't too many ingredients I needed to buy. I picked up everything at the store except they didn't have corn tortillas. The past few years I have really come to hate grocery shopping - I can never seem to find everything I need at one store and who has time to run from store to store all the time? I can't even stick to my pledge to buy my fruits and veggies from the local market store (until the farmers market really takes off) instead of the grocery store. ANYWAY, I couldn't find corn tortillas so I'd just planned to make the dish without them. And then if we loved it and wanted to have it again I'd hunt down the corn tortillas. But then I remembered that down in the basement hidden away from us (me) were the leftover Halloween bags of Doritos. That's practically a corn tortilla right? So I used that instead and wow, Migas are really good. I crumbled the chips fairly finely and didn't use a lot, so they really didn't play much of a part. But I could feel their texture in a few bites and will definitely make these again when I can get my hands on some corn tortillas. Heat the oil in a large pan over medium high heat. Add the chorizo and cook until the sausage starts to crisp. Add the diced onion, jalapeno and garlic and cook, stirring, until the onion is soft. Add the eggs to the pan, lower heat if necessary, and stir. Crumble in the doritos and add the diced tomatos. Stir until the eggs are almost set, then add the cheese. Cook until the eggs are scrambled to your liking. Spoon onto plates, top with a dollop of sour cream and some diced avocado, and serve. When we went to the first Farmers Market of the year a few weeks ago the selection was slim as it always is in April, but perhaps even a little slimmer, with the horrible start we've had to spring. We bought a handful of things - some bread, dried apples, fall potatos from cold storage, and some beautiful cold storage carrots too, I think they were called Dragon Carrots, or maybe Red Dragon Carrots. I quickly tired of grating them into salads and serving them steamed with butter. I wanted something new and different. To us, anyway. And perhaps something I'd want to make more than once, we've got a lot of carrots. That very afternoon we stopped by the Symphony book sale where I bought 3 cookbooks including The Inn Chef, Michael Smith's first book. I am a longtime fan of his, I love Chef at Home, his series on the food channel and all his recipes I've tried have been very good. And in this particular book I found a recipe for Balsamic Glazed Carrots - oven roasted carrots finished with a drizzle of balsamic. Mmmmm! Aren't these carrots crazy? I love them! In a roasting pan, toss the carrots with the oil and salt and pepper. Roast the carrots for 10 minutes, then shake the pan. Roast the carrots until caramelized, another 20 minutes, stirring them frequently. Transfer the carrots to a bowl. Scrape the remaining bits and oil from the pan into the carrots. Add the vinegar and toss until the carrots are evenly coated. Reserve briefly or serve immediately. Are you a food tv watcher? What's your favorite show/host? Who don't you like? Who do you miss?